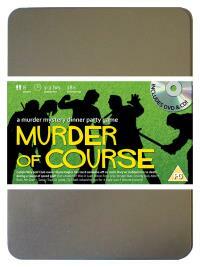 You've been invited to play the role of ALBERT ROSS in Murder of Course. Glynn Eagles, owner of the prestigious Callow Way Golf Club, has just announced plans to build a new exclusive golf resort and is hosting a party to celebrate. However, during a round of golf before the party begins, Glynn is clubbed to death on the green of the 18th hole. Join us to find out who ended his round early! Tour Pro (he plays with the best for at least the first round!) Costume Suggestion : To say you’re a labels man would be a disservice. In fact, if it doesn’t have a label you won’t wear it. Brand-name polo shirt, trousers or shorts, golf glove, golf visor, sunglasses, even golf balls. After all, you get paid by each and every sponsor. You’ve been the tour pro at Callow Way for the last year. It’s a great opportunity to meet the fans and share some of the golfing wisdom you’ve obtained over the years. If anyone would like an autograph, you’d be only too happy to oblige.